Several district attorneys in Texas have decided to not prosecute minor marijuana possession offenses in their respective jurisdictions. For instance, in Houston’s Harris County, if you are caught with four ounces or less of marijuana, you will have the drugs confiscated and you will have the option to take a drug class. That means you do not have anything on your record, you do not risk jail time, you do not have to pay a fine and you do not even have to appear in court. Now several bills in the Texas legislature are looking to decriminalize marijuana statewide. In fact, eight of the twenty seven marijuana related bills in the legislature are decriminalization bills. Each of the bills would make minimal changes to existing law to reduce the ramifications of possessing small amounts of marijuana. Each bill handles possession penalties differently but there are some commonalities among the proposed laws that indicates that lawmakers make be close to a consensus regarding what should be considered a “small amount” and what the penalty should be for possession of small amounts. The most lenient bills, would decriminalize having less than an ounce of marijuana. H.B. 63 and its sister bill in the senate, S.B. 156, both would change the law so that being caught in possession of less than an ounce of cannabis would not be a considered a conviction on a person’s record. At most a person with a small amount of cannabis would be made to pay a $250 fine. Both bills state that an arrest cannot be made and a warrant cannot be issued if the only alleged offense is possessing a small amount of marijuana. It even provides that a court that determines an alleged offender to be indigent can perform no more than 10 hours of community service in lieu of the $250 fine. Monday, the jurisprudence committee heard testimony on H.B. 63 in a three-hour public hearing. Attorney David Sloane testified before the committee. 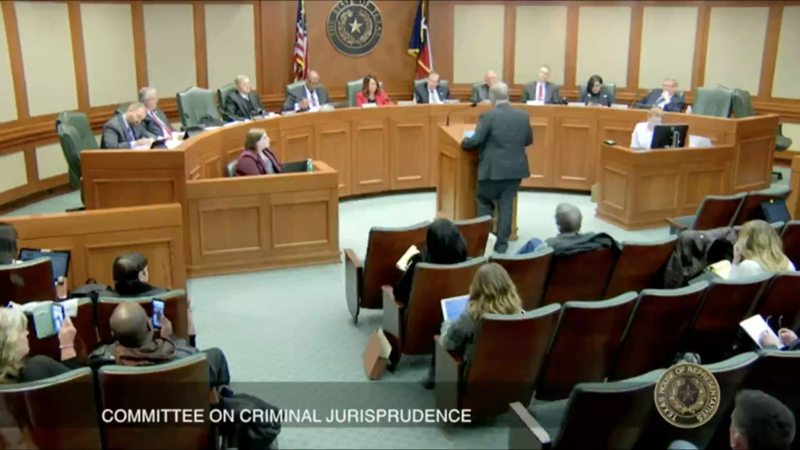 Sloane brought up his experience as a former police officer and called out the attempts by those opposed to the bill to conflate marijuana with gang violence and other drugs, in asking the committee to make the rational choice and do the right thing. Sloane’s passionate testimony in support of the bill drew applause from the gallery and you can see his testimony at the top of this post. To see more video of the hearing, click here. The majority of the other proposed pieces of legislation would simply change possessing less than an ounce to a Class C misdemeanor. Currently, Texas law makes possessing two ounces or less a Class B misdemeanor. A Class B misdemeanor means a fine up to $2,000 and up to six months in jail. A Class C misdemeanor on the other hand is a fine up to $500 with no jail time. Four of the bills would reduce having less than one ounce of marijuana to a Class C misdemeanor, with H.B. 1206 making it a Class C even if a person possesses up to two ounces. One bill, H.B. 753 would only allow for a person to possess up to .35 ounces or about 10 grams before the crime goes from a Class C to a Class B. Yet another bill, S.B. 460 would simply increase the threshold volumes for each offense. So, anything up to four ounces would be a Class B, whereas currently anything up to four ounces is a Class A. Under S.B. 460 a Class A would mean possessing over four ounces but up to five pounds of marijuana. What is the Future of Marijuana Decriminalization? So what does all of this mean? We may not know which of these bills is likely to pass but by following the common threads can we at least come to a reasonable prediction of what a bill that would reduce minor possession penalties might look like? It’s hard to say, but having under one ounce seems to be what lawmakers agree is a small amount. Decriminalizing such an amount is only proposed in two of the bills, so it would seem lawmakers might find knocking possession of less than ounce down to a Class C misdemeanor from a Class B misdemeanor more palatable. Of course there are several potential road blocks which could mean no marijuana legislation could be passed but with 27 bills on the table it seems significantly more likely the marijuana tide may turn during this legislative session than it did in 2017 when there were four bills, only one of which called for decriminalization. That bill was Mr. Moody’s aforementioned attempt last session.